Generic Company Place Holder CBS Sports NCAA?? March Madness on Demand?? For fans of college basketball, there’s no better time of year than the NCAA men’s basketball tournament. It’s wall-to-wall hoops action, particularly during the tournament’s opening round when 32 games are crammed into two days. All those bracket-busting Cinderellas, buzzer beaters, and memorable moments—it’s really a wonderful thing for sports fans. Unless you’re nowhere near a TV. Then, it’s kind of a bummer. But it doesn’t have to be—not if you have an iPhone or iPod touch, at least. Because in one of those “It can’t be too long before they start making flying cars” moments, CBS Interactive offers a $10 app that lets you watch every NCAA tournament game from your mobile device over any kind of network connection. If you live and breathe college basketball, that’s not just a must-have app—that’s grounds for a Nobel Prize. This is the second year that an app has delivered the NCAA basketball tournament to the iPhone. Last year’s offering was serviceable, if a bit frustrating. The video was a bit jumpy and prone to freezing. More significantly, you could only watch games over a Wi-Fi connection; if you only had 3G or EDGE connectivity, you were restricted to an audio-only feed. 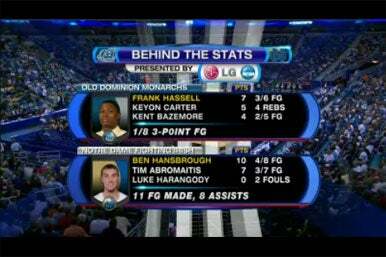 That’s the most significant change with this year’s edition of CBS Sports NCAA March Madness on Demand. With AT&T getting less persnickety about which apps are allowed to send data over its 3G network, the March Madness on Demand app can now display live videos feeds over 3G and EDGE just as easily as it can over Wi-Fi. ... but the picture’s a lot more clear over a 3G connection. March Madness on Demand made some other welcome changes since last year’s edition. While streaming video, you can tap on the screen to pull up the stats of the teams involved in the current game, which will appear over the action. You can also summon scores from other in-progress games, tapping on those scores to switch over to that video feed. Know the Score: March Madness on Demand now supports push notifications, and can let you know when a game is going down to the wire. Another nice addition to this year’s version of March Madness on Demand is support for push notifications. 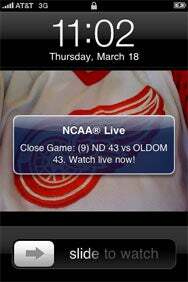 You can have the app alert you when a game involving a specific team is about to start, reach halftime, or end. In a particularly nice feature, you can also set alerts for potential upsets (when a lower-seeded team has the lead with five minutes to play), close games, overtime, and breaking news. March Madness on Demand also includes a scoreboard, an updated tournament bracket, news, and video highlights. You’ll also find these features in the free CBS Sports NCAA March Madness on Demand Lite, which does not offer live audio or video. The only notable feature in the lite version is the video highlights tab; otherwise, you’d be better off sticking with the scoreboard app of your choice. As nice as the improvements are to March Madness on Demand, video quality still lags behind what you’d find on the CBS Sports Website. Then again, that’s of little comfort if you’re not anywhere near a Web browser. To that end, CBS Sports NCAA March Madness on Demand is a great app to have if you want to keep abreast of the month-long NCAA tournament when there’s no TV or computer at hand. It’s especially worth the $10 cost if you download it the Thursday or Friday of the tournament’s opening round, so that you can get the most tournament bang for your buck.